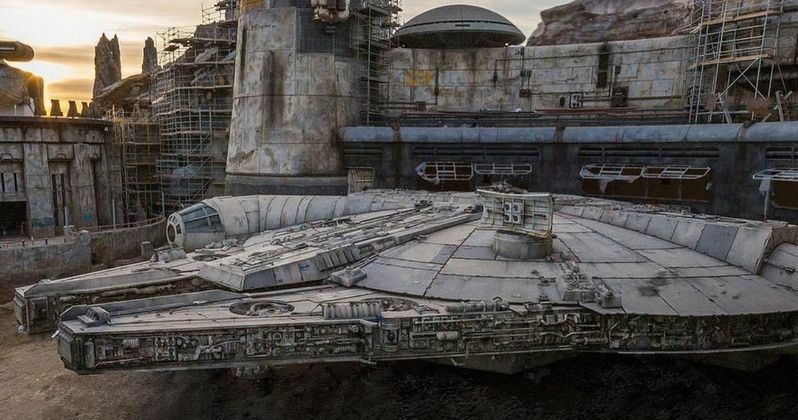 Disneyland has shared an awesome look at the finished Millennium Falcon from Star Wars: Galaxy's Edge. The new part of the Anaheim and Orlando theme parks will open this summer and fall, respectively, and Star Wars fans are starting to get pretty excited about getting immersed in the universe. One of the key new attractions is the Millennium Falcon, which will reportedly be able to serve 1,800 riders an hour, which is pretty impressive. Lucky members of the press have been able to ride a test version of the attraction and the early reactions have been positive. The picture that Disneyland released shows off the iconic ship as construction continues around it. There's still quite a bit more of work to go before Star Wars fans will be able to check out Galaxy's Edge, but the wait is nearly over. When it was announced that the Millennium Falcon was completed, aerial pictures of the new area of the park started to spread online, showing off an impressive amount of work by the team responsible for building. While 1,800 riders an hour for the Millennium Falcon attraction is impressive, it's not as efficient as some of Disneyland's other rides. In comparison, Pirates of the Caribbean handles about 2,800 riders per hour, Big Thunder Mountain can handle 2,200, and Haunted Mansion is able to pull off 2,100 riders in an hour. But, that's only if things are running smoothly. Additionally, when Star Wars: Galaxy's Edge opens, both theme parks are expected to get some record-breaking crowds, which will make for some pretty long waits for everything. Disneyland attracted 18.3 million visitors in 2017 alone, which puts an average of about 50,100 visitors per day. The current capacity of the park is around 70,000 visitors in a day, which will increase once the new 14-acre area of the park opens. To try and keep crowds down, only Disneyland annual passholders with the most expensive pass will be able to visit Galaxy's Edge when it first opens along with daily park visitors, so if you have one of the discount annual passes, you'll have to sit this one out or spend a little extra and get a day pass. Additionally, the summer time is when a lot of the cheaper annual passes have blackout days, so that should cut down on a fraction of the new visitors who are excited to see the Star Wars rides. With that being said, it has been estimated that the wait for the Millennium Falcon: Smuggler's Run and the Star Wars: Rise of the Resistance will be around 6 hours when Galaxy's Edge first opens. It has been rumored that both Disney parks will be implementing a new version of their MaxPass reservations, which will reportedly be the only way to get on the rides. The latest MaxPass reservation system is already up and running at Disneyland and it ties to cell phones for an extra cost per ticket, allowing visitors to go on other rides while they wait. It has not been confirmed of this will be the only way to get on the new rides at this time. While we wait for Galaxy's Edge to open, you can see a brand-new picture of the finished Millennium Falcon below, thanks to the Disneyland Instagram page.